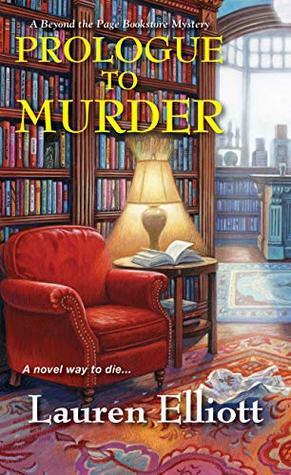 Prologue to Murder by Lauren Elliott is the second book in the Beyond a Page mystery series. Addie is, once again, under the scrutiny of the townspeople of Greyborne Harbor. Gossip reporter "Miss Newsy," from their local paper, stirs up new questions when the town librarian goes missing. When she turns up dead, it's up to Addie to find the killer and squash the questions surrounding her. I had fun visiting Greyborne Harbor. I like the small town feel the story brings. I can see myself walking down main street, seeing all the shops and having lunch at the bakery next to Addie's bookshop. Lauren included more of the town's history. It adds to the story and gives me a glimpse into Greyborne Harbor's colorful past. I enjoy the characters. It's a small town so there's plenty of gossip. They add a colorful flare and a wonderful quirkiness to the town. Addie, Serena and Marc are funny and add wonder to the story. Addie is a smart, strong woman who proves to be a clever and skillful sleuth. She is fast becoming one of my favorites. Serena is always funny and whimsical. I like her. She always makes me laugh. Marc is studious when it come to his police work and caring when it comes to Addie. they leave me wanting to know more about their lives. The mystery is on the edge of your seat excellent. It pulled me in from the first page and held me fast until the end. With all of its twist and turns, it kept me guessing. I couldn't put it down. I really like how Lauren used the history of the town as part of the mystery. I recommend this book to mystery lovers who like to be kept guessing and engaged until the very end. I received this ARC copy of the book from the author for review. This is my honest review. I also suggest reading the first book of the series Murder by the Book. It is also a great read.